of Eclipse last night with the girls. . . I did in fact spend the night in Forks. And that's almost as cool. That is AWESOME! Wow. Wow. Did you get your pic next to Bella's Truck ? I think it's hilarious. This series has definitely put Forks and La Push on the map! So funny, and I guess pretty cool...If you're into screaming teenagers...hahaha I will wait for the movie to be out a few weeks before I see it, less teenage drama that way! I told a couple of friends on FB that my "internet friend" from Hawaii spent the night in Forks last night and was at La Push, also. Just to let you know...you're apparently the "bees knees". ha ha!! So funny. we missed you! but how awesome is this!? p.s. just wanted to let you know that our whole family has been vaccinated as of today! Our 7 week old got his first set, the husband and I got our booster and we checked to be sure our 2 other little ones were still good on their vaccinations! Don't be ashamed. 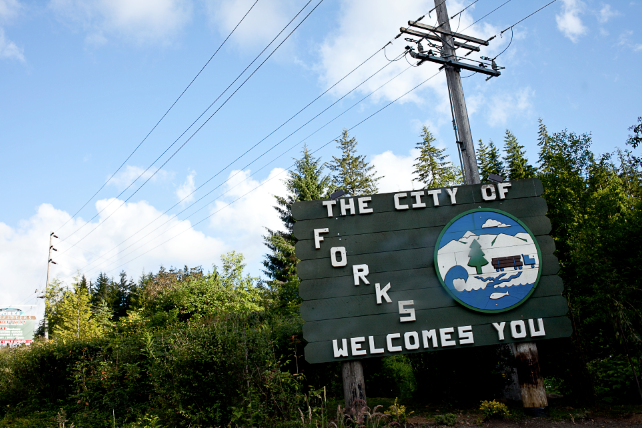 Forks is just THAT magical! Totally cool. I am totally jealous! totally cooler than being shushed and not being able to scream like a 12 yr old. your night sounds so much cooler!